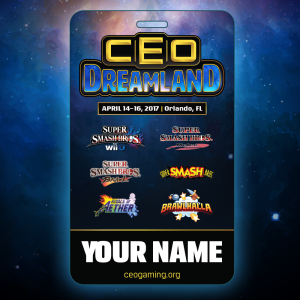 CEO Dreamland Registration is now LIVE! CEO Dreamland takes place at the Wyndham Orlando Resort on April 14-16 in Orlando, Florida. For more information on the venue please visit the hotel information page here. The registration fee, also called the venue fee, is a one-time cost that every player must pay when entering any number of tournaments or coming to play games casually in the bring-your-own-console area. Entering one tournament, or six, still only costs you the venue fee one time. The venue fee goes toward paying for the event hall, production, badges, equipment and other costs, while the tournament fees themselves go 100% directly into the prize pool for each game. You must be at least 13 years of age to compete in any official tournaments. All badges include access to the entire venue for the weekend. Spectators receive the same access but may not enter any official tournaments. Please keep in mind that official tournaments may start as early as Friday April 14th at Noon EST. Doubles are planned to kick off Dreamland weekend on Friday at Noon, If Singles tournaments exceed over 512 entrants in a game, Singles pools may start as early as Friday Afternoon at Noon otherwise they will begin on Saturday April 15th at 10 am with Finals on Sunday April 16th. A Final Schedule will be posted after Registration closes April 2nd. Visit ceogaming.org/dreamland for tentative schedule and info. $50 Last minute Registration from March 19th until April 2nd. On April 2nd Player registration will be closed so that we can make bracket assignments and final schedule accordingly. Spectators will be able to still purchase weekend badges for $25 until April 12th. On Site badges for the weekend will be $30. Single Day Wristbands will be on sale at the registration office for $15 per day. 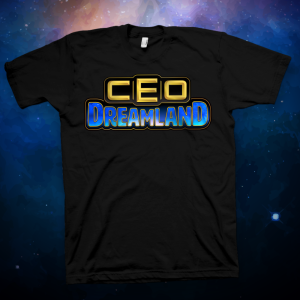 CEO Dreamland will NOT have any on site late registration for competitors. You MUST register online before by 11:59pm edt April 2nd to compete in any official Tournaments. You can Pre-order the official Dreamland T-Shirt and Tanktop while registering for the event as well as a Customized badge with your name on it! Purchasing the contributor badge will also let you skip the normal registration line so you can pick your badge up on arrival even faster. You’ll be able to pick these up when you arrive at the event. All registered Players and pre-paid Spectators can pick up their badges anytime over the weekend Starting Thursday(4/13) from 5-9 PM, Or Starting Friday(4/14) at 8 AM at the registration office. You may pick up your badge at anytime as long as it’s an hour before your tournament day and start time once pool schedules are announced. 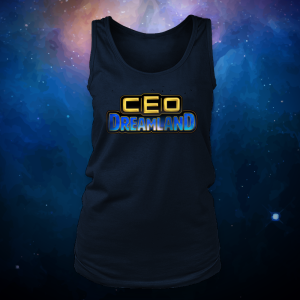 If you have any questions about CEO Dreamland please contact us at CEOGaming@gmail.com. You Can register directly on www.Smash.gg/ceodreamland or below. You can sign up now and re log into your Smash.gg account to add more games later on. If you need to swap out games or badges to another player if you can not attend please contact ceogaming@gmail.com before the deadline of April 2nd.